NOTE: Sunday (and Saturday) fast nationals still delayed. NETWORK FINALS: There were 0.1 drops for BLUE BLOODS, GRIMM and DATELINE in final numbers. CABLE HIGHLIGHTS: Despite many COLLEGE BASKETBALL tournaments on Friday cable, Discovery continued to rule the night with GOLD RUSH, steady at 1.05, and with a special AFTER-SHOW at 0.84. The highest rated of ESPN’s tournament games was Duke vs. North Carolina in the ACC at 1.01. Disney Channel’s TANGLED series premiered strongly at 0.73, decisively stronger than its Nickelodeon competition, TEENAGE MUTANT NINJA TURTLES at 0.34. 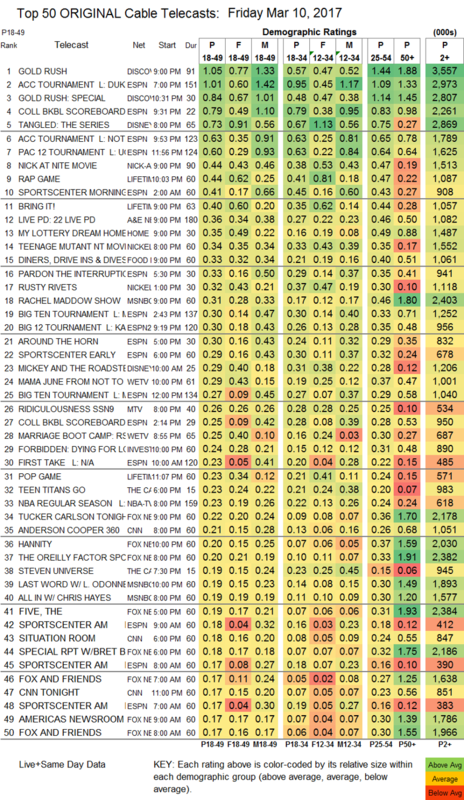 On Lifetime, THE RAP GAME ticked up to 0.44, and BRING IT was up 0.06 to 0.40, followed by a special late-night episode of THE POP GAME at 0.23. A&E’s LIVE PD held at 0.36. On HGTV, MY LOTTERY DREAM HOUSE lost a tick to 0.35. Food Network’s DINERS, DRIVE-INS & DIVES returned at 0.33. The highest-rated news show of the night was again MSNBC’s surging THE RACHEL MADDOW SHOW at 0.31, and even more notably, Maddow topped Fox News’s TUCKER CARLSON TONIGHT not just in the Total Viewers demo, 2.4M vs. 2.2M, but even in Fox News’s 50+ home base, 1.80 vs. 1.70. 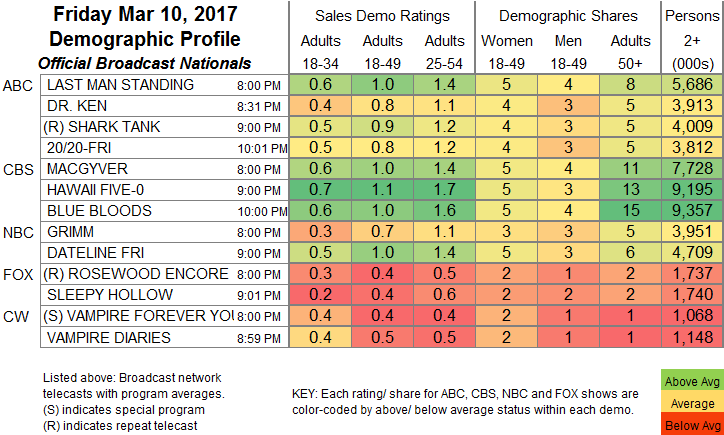 We’s MAMA JUNE: FROM NOT TO HOT fell 0.08 to 0.29, while MARRIAGE BOOT CAMP was up 0.04 to 0.25. MTV’s RIDICULOUSNESS ticked up to 0.26. ID’s FORBIDDEN was steady at 0.26.